Boeing delivered Etihad Airways’ first 787-9 Dreamliner sporting the airline’s new “Facets of Abu Dhabi” livery which was revealed at a ceremony earlier this year. The colors are reminiscent of the desert landscape, inspired by the culture, Islamic design and architecture motifs of the United Arab Emirates. 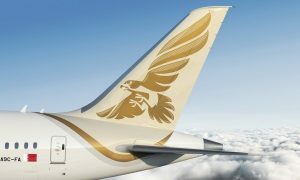 The airplane is the first of the 71 Dreamliners that the national airline of the United Arab Emirates has on order which includes 41 787-9s and 30 787-10s. 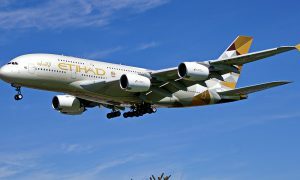 Etihad Airways will also be the first airline in the Middle East to operate the 787-9. 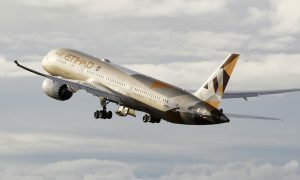 “We are confident that the additions of the 787 Dreamliner to our growing fleet will enable us to continue to add vital long-haul destinations from our Abu Dhabi hub,” said Peter Baumgartner, chief commercial officer for Etihad Airways. “We will first use the aircraft on routes to cities such as Dusseldorf, Washington D.C., Mumbai, Brisbane and Moscow and will have over 70 within the fleet, once our order is complete. 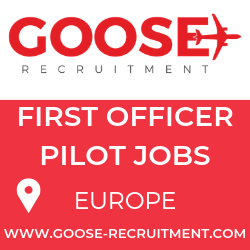 “The aircraft meets our requirements on these routes and will enable us to continue to provide the highest levels of customer service to the guests we welcome on board,” he added. In addition to bringing big-jet ranges to midsize airplanes, the 787 provides airlines with unmatched fuel efficiency, resulting in exceptional environmental performance. The family uses 20 to 30 percent less fuel with 20 to 30 percent fewer emissions than the airplanes they replace. The airplane also has more cargo revenue capacity – a 20 to 45 percent advantage over replacement airplanes. The 787-9 can carry 280 passengers 8,300 nautical miles (15,372 kilometers). The 787-10, launched in June 2013 and in development now, will fly 323 passengers up to 7,000 nautical miles (13,000 kilometers), or more than 90 percent of the world’s twin-aisle routes. As of November 30, 2014, 58 customers have ordered 1,055 787s.